As soon as the first glimpse of Spring arrives I can't help but want to make lots of bright things featuring yellows and greens – it happens every year without fail! That being said we had snow here less than a week ago (not so Spring-like! ), however no matter what the weather is like, the sight of bright, vibrant daffodils and tulips always makes me feel like Spring is in the air. 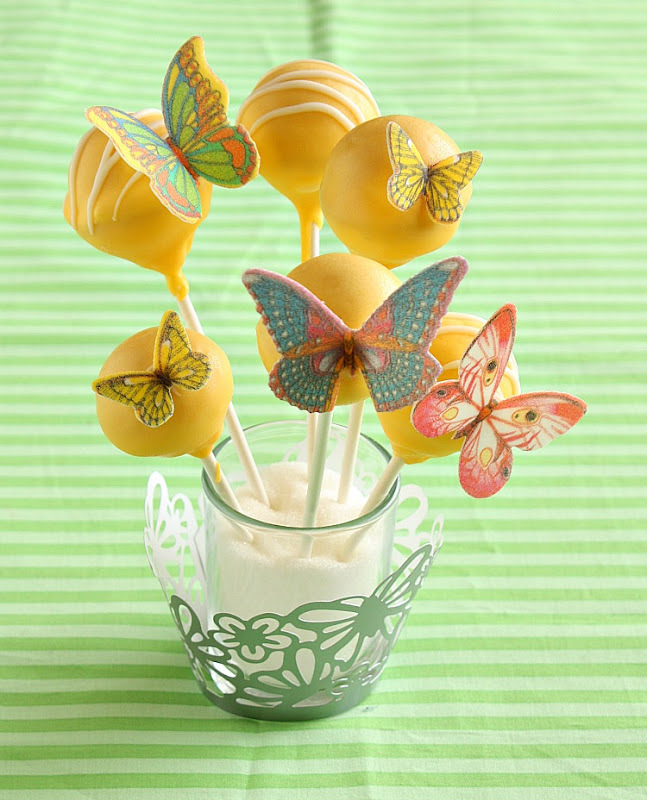 To start getting excited about the prospect of Spring being just around the corner I couldn't resist making these Lemon Butterfly Cake Pops. It's also Mother's Day in the UK this month (March 18th) so I thought these would make a delicious and beautiful addition to my Mother's Day Afternoon Tea that I did last year – especially since my Mum and I love Butterflies and they always remind us of my Grandma as she also loved them (and most likely initiated our love for them!). Even better, I also have my Mum staying with us just now so she can actually enjoy them for once rather than just having to look at the pictures on my blog! To make the cake pops put the flour, baking powder and salt in a bowl and mix. In the bowl of a KitchenAid (or similar) free-standing mixer add the butter, sugar and lemon zest and beat until light and creamy. Add the eggs. Once everything is well mixed add 1/3 of the flour mixture then ½ of the milk. Mix together then add another 1/3 of flour followed by the remaining milk. Finish with the last of the flour then mix until everything is properly combined – do not over mix though. Spray or wipe a little oil on the cake pop maker then heat it up (according to manufacturers instructions) until it is ready. Spoon tablespoons of the mixture into the holes then allow to cook for 4-6 minutes (5 seems to work for me). Carefully remove the cake pops from the machine (the whole thing gets very hot so be extra careful) and allow to cool on a wire rack. Repeat the process until all of the cake batter is used up. Once the cake pops have all cooled melt the candy melts according to the instructions on the packet. Once completely melted and smooth add enough oil to make the coating thin enough to evenly coat the cake pops (I find the best consistency is when it drizzles and falls evenly and easily from a spoon). Dip the end of a cake pop stick into the melted candy coating then carefully put into the cake pop – just about ½ way through. Repeat this then pop the cake pops in the freezer for 5 - 10 minutes. This allows the sticks to properly harden and makes it easier to dip the cake pops. One at a time dip the cake pops into the icing until evenly coated. Tap them on the side of the bowl to shake off any excess icing then carefully stick them in a block of styrofoam covered with tin foil. If you like you can drizzle a little white icing over them. Once dry add a small amount of the icing where you want to stick the butterfly and carefully press on. Hold until it has stuck the repeat with the remaining butterflies. These are adorable!! What a great, beautiful Spring idea! The bright yellow really does remind you that Psring is coming soon, I can't wait. Awesome pops! These are stunning! So beautiful. These are so pretty.... I love the butterflies. I didn't even know they made waffer butterflies. LOL they are sooo pretty, where do the wafer butterflies come from? Thanks Fiona! I actually bought them a while ago from Edible Glitter in the UK (http://www.edible-glitter.co.uk). They weren't quite what I was expecting so I wasn't sure how best to use them...Turns out they are just perfect for these cake pops!! Those are sooooo pretty! What a great idea for Springtime! These are beautiful, Congratulations on Top 9! Stunning job! Butterflies are my favorite thing about spring... lovely! 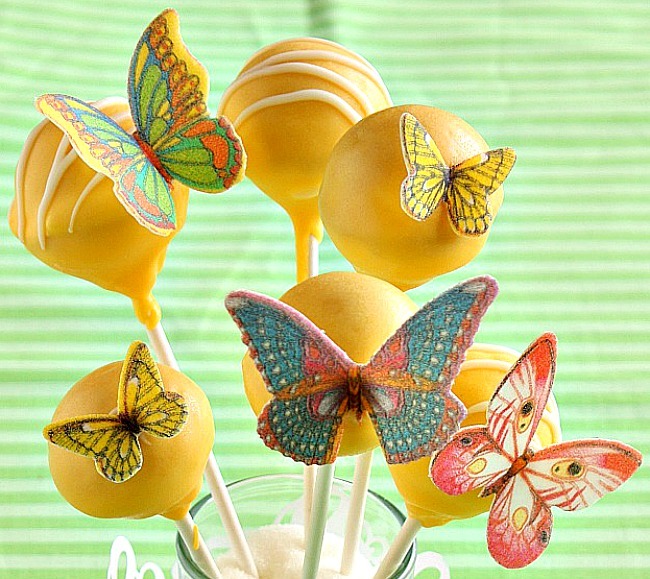 Gorgeous cake pops! Congrats on the Top 9....well deserved!! Congrats on Top 9! I know I'm late getting here, but was happy to see your blog represented!And such a pretty Spring-y offering, to boot! Congratulations for being Top 9 on foodbuzz :) these look soooo pretty!!! 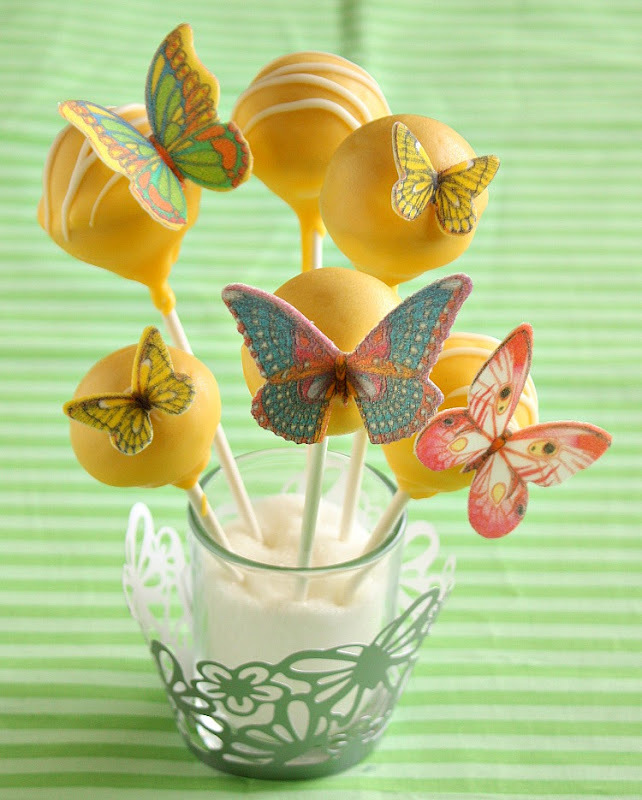 I've never made cake pops but should really try ~ too adorable!